Elon Musk unveiled the new feature for the Model M and Model X, which aims to gradually remove the need for drivers to complete certain actions. 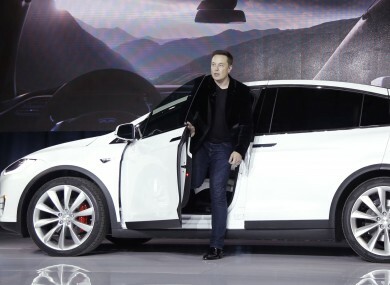 Tesla Motors's CEO, Elon Musk, introducing the Model X car late last month. TESLA MOTORS HAS launched an autopilot mode for its electric cars. While not fully autonomous, the software for both the Model S and Model X can automatically steer, change lanes and adjust its speed in response to traffic. Drivers are still required to keep their hands on the steering wheel, and its CEO Elon Musk advised caution to drivers when using it, saying they’re liable if they get into a crash. “It should not hit pedestrians, hopefully”, said Musk. “We want people to be quite careful [when using it]“. The system uses a combination of features like a GPS, forward-facing camera, 360-degree ultrasonic sensors, forward radar, and mapping data to determine its position and help it navigate. As well as coping with traffic, it is able to scan for a space and park itself when it reaches its destination. The plan is to gradually introduce features which remove the need for drivers to carry out certain actions, but Musk said that over time, it would gradually become a better driver than a person. The update will arrive in the US first while other parts of the world will later receive it, pending approval from regulatory authorities. Self-driving and autonomous cars are currently being developed by Google, BMW and Volvo, with testing still ongoing. Email “Tesla's autopilot mode for cars 'hopefully' won't hit pedestrians, says CEO”. Feedback on “Tesla's autopilot mode for cars 'hopefully' won't hit pedestrians, says CEO”.